Made up some mechanics for a Midwestern themed set. 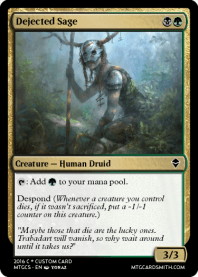 Cultivate X: At any time, you may exile a card with cultivate attached to target land that doesn't have cultivate counters on it, and put X cultivate counters on that land. Whenever you tap that land for mana, you may remove one of the cultivate counters from that land. When the last is removed, you may cast the spell without paying its mana cost. Connect: An action that allows you to connect two different lands. These lands both produce mana they would normally produce and mana the land they are connected to would normally produce. Construct: The construction action happens. The construction action itself doesn't do anything, but cards on the battlefield may trigger off of a construct action, for example, a creature card with "Whenever you construct, gain 2 life." So, I've got a pretty good rules/term question @kkarn, @Corwinnn, @Tomigon, @Memnarchitect, @cadstar369, @Platypusburger, @Animist, @AustinSmith, @Gelectrode, @Grimshac, & @Cryptonight. Up until now WotC was used the term "Sacrifice" very loosely, allow me to elaborate briefly. If a permanent would die for any reason without initiation on the part of an opponent, it is termed "Sacrifice this [permanent]". Keywords such as Echo, Fading, Vanishing, etc. all follow this protocol. I conjecture that the term "Sacrifice" is more appropriate as a cost or triggered ability brought about by a flavorful reference: keywords such as Exploit, spells such as Bone Splinters, and many Demon cards (Demonlord of Ashmouth) are prime examples. Sacrifice is, in my understanding, a "[permanent]-death-term" independent of opponents as it is "controlled" by the sacrificed permanents controller. The only things that actually effect the act of sacrificing permanents are effects and abilities that directly reference it (Tajuru Preserver and Angel of Jubilation, to name two). Now, onto the point of this debate. We are all aware that terms "die", "dies", and "died" frequent MTG usage. As the word "sacrifice" is connotative of "offering with expectancy", doesn't it seem odd that that it is always the term utilized to signify something dying of its own? Often it is even unpreventable (Cumulative upkeep, etc.). Judge ( @kkarn ) and Jury ( @everyone_else ), I move that we replace future such "non-payment" (and non-reasonable) "death effects" with "it dies". "If up to three creatures would die in a turn, regenerate them. If four or more creatures would die in a turn, regenerate up to three target creatures among them, then Weary Surgeon dies." among them and sacrifice Weary Surgeon. Most likely (as we are so accustomed to the preexisting terminology) this looks out of place and/or incorrect. But, from a logic/flavor standpoint, Weary Surgeon "dying" (from exhaustion) makes far more sense then his controller sacrificing him. @opcode_6e Platinum Angel doesn't actually prevent damage from being marked on players; it just prevents its controller from losing as long as it exists, no matter how low their life gets. You could literally have, like, negative 500 life and still not lose as long as you have Platinum Angel on the field. You could also have a completely empty library and 50 poison counters and still not lose. But that doesn't change the fact that you have -500 life and 50 poison counters, and you'll lose the game as soon as Platinum Angel is removed from the battlefield (or from your control). And even if you have Platinum Angel out, you can still lose life and gain poison counters. Platinum Angel doesn't stop damage from being marked or counted against you. True "ignoring damage" would have you taking, say, 5 damage and not losing any life (because the damage got replaced with something that couldn't happen, like, say, forcing you to sacrifice lands when you don't have any lands). Anyways, here's my next idea. This isn't a new keyword, but an extension of an existing one's applications. By default, loyalty abilities of planeswalkers can only be activated when you could cast a sorcery - during your main phase, when no other spells or abilities are on the stack. If a loyalty ability has flash, that ability can be activated at any time - during any phase, while other spells or abilities are on the stack, and even during another player's turn. However, the restriction of only activating one loyalty ability each turn still applies. When you activate one of a planeswalker's loyalty abilities, you cannot activate another loyalty ability of that planeswalker until your next turn. If a loyalty ability has flash, you can only use it on another player's turn if you didn't use any loyalty abilities of that planeswalker on your turn (or at any point since your most recent untap phase). Planeswalker abilities have flash independently of one another; a given ability may or may not have flash, regardless of if other loyalty abilities of that planeswalker have flash. If a planeswalker card has flash, that just means that you can cast the planeswalker itself anytime you could cast an instant; it doesn't necessarily mean that any of the planeswalker's abilities have flash. Things get a bit more complicated when a planeswalker who has a loyalty ability with flash somehow gains the ability to activate more than one loyalty ability each turn. Essentially, the planeswalker has a number of "allowed loyalty activations" that are renewed during its controller's untap step, and each loyalty ability activation consumes one of the allowed loyalty activations. When they are completely depleted, the planeswalker cannot activate any more loyalty abilities until its controller's next untap step. In this respect, the only difference between a loyalty ability with flash and a loyalty ability without flash is that a loyalty ability without flash can only be activated when its controller has priority during his or her main phase and the stack is empty (e.g. when they would be allowed to cast a noninstant spell without flash), and only when the planeswalker's remaining number of allowed loyalty activations is greater than zero and, if the cost is negative, the planeswalker has enough loyalty counters to pay for it. A loyalty ability with flash is still restricted by the planeswalker's loyalty counters and remaining loyalty activations - if the planeswalker doesn't have enough of either, the ability can't be activated - but can be activated any time the planeswalker's controller has priority, regardless of the current phase or whose turn it is. A planeswalker's default number of allowed loyalty abilities is one, meaning that it can only activate one loyalty ability before having to wait until its controller's next untap step to activate another. If an effect increases that number by one, the planeswalker can activate two loyalty abilities before having to wait until its controller's next untap step to activate two more loyalty abilities, and so on and so forth. @Luigifan Platinum Emperion, not Platinum Angel. It has the ability "your life total can't change," so damage still affects you (and any triggers that rely on damage will still occur), but your life total doesn't actually change. Same deal with Angel's Grace if your life total is 1. You still take the damage, but your life total doesn't change. EDIT: Now that I think about it, a succinct way to codify "damage ignoring" for players would be "If a player is dealt damage, but that damage doesn't cause life loss." @Faiths_Guide I don't think your proposed change is a good idea because the term "sacrifice" is often used in costs, so if you changed everything to your proposed wording, we would have things like "Kill this creature, it can't be regenerated: X happens." When sacrifices are not a cost, you could just as easily say "destroy this creature. It can't be regenerated" and you wouldn't need new templating. "Sacrifice this creature" is just less text. "Players can't sacrifice other creatures. At the beginning of each upkeep step, remove all fatigue counters from Weary Surgeon. Whenever a creature other than Weary Surgeon would die and there are three or fewer counters on Weary Surgeon, regenerate it and put a fatigue counter on Weary Surgeon. If there are four or more fatigue counters on Weary Surgeon, sacrifice it." EDIT2: Added a counter check in the replacement effect. Otherwise, mass destruction by damage would regenerate all creatures that died, not just three of them. Well, first off, my recommendation suggests leaving cost alone. No worries there. Second, regenerate actually doesn't have to do with creatures dying. Rather, it has to do with creatures being destroyed or being put into a graveyard as a result of marked damage. My template-ing would result in slightly less text (in most cases) because it uses "it dies" versus "sacrifice it". This can be seen on the alternate wording for Weary Surgeon above. Yes, I had thought about tracking it with counters. It's probably the safest solution. @Faiths_Guide: Now that I think about it, trying to replace destruction directly with regeneration is kind of an interesting rules quandary. Are there any real cards that do it? If the creature has lethal damage marked on it, replacing a "death" with adding a regeneration shield works just fine, since it still has lethal damage marked on it, and state-based effects would just kill it again. The problem is what happens when the "death" you're trying to replace comes from a non-damage destruction effect. If you totally replace the destruction effect with adding a regeneration shield, the destruction effect will be totally erased rather than applied right after regenerating as you would expect. You would have to do something weird like "If this creature would be destroyed, regenerate it, then destroy it." Now, in regard to Weary Surgeon specifically, no, he isn't replacing death with a regeneration shield because it doesn't state "instead". I merely happens if they would die, then, if they would, the regeneration shield is checked to see if it would prevent the cause. If the creature is dying from effects other than destruction or marked damage, it will still die (as currently worded). He is just a Human Cleric, not a Human Wizard Cleric after all. @opcode_6e The problem is that ignored damage is meant to be defined as damage that, due to bizarre rules shenanigans, has no meaningful effect outside of triggering abilities. Stuff like Szadek and creatures with infect or saboteur can damage players without actually changing their life totals and still have quite an impact. Also, I'm pretty sure that regeneration removes all damage from the creature being regenerated. Otherwise, it would be useless at saving creatures killed in combat. Regeneration is a replacement effect that replaces destruction. Destruction refers to both effects that say 'destroy' and the statebased action that puts a creature with lethal damage marked on it into its owner's graveyard. Regeneration replaces a destruction event with one that removes all damage marked on the creature, taps the creature, and removes the creature from combat. At the beginning of each upkeep, remove all fatigue counters from Weary Surgeon. Whenever another creature would die, if there are three or fewer counters on Weary Surgeon, regenerate that creature and put a fatigue counter on Weary Surgeon. The surgeon will still save 'too many' creatures if they all would die at the same time. Also, that thing needs to eat a Shock. It's too strong to let live. He only saves up to three now. To return the comment you tagged me on regarding replacing the text "sacrifice it" with "it dies", I'm against it. It may not feel flavorful, but I don't like the vagueness of just saying that something dies. Death needs a reasonable source in Magic. Opening up the idea of 'it dies because it says it dies' seems like it will just muddy things. So you could say something like: When a counter is placed on Weary Surgeon this way, if it has three or more counters on it, destroy it. Functionally it's mostly the same, but it may be closer to the flavor you'd like. Thanks a bunch! I think you're absolutely right. Manalink is essentially lifelink as applied to your mana. (However, I deliberately had it give you mana by untapping your lands instead of adding mana directly to your mana pool, for four reasons: one, I didn't want to have to decide what type of mana to add to a mana pool for each manalink ability; two, adding mana directly to a mana pool would run afoul of the rule that unused mana in a mana pool is lost after each phase and step; three, limiting the mana gained from manalink to how many (tapped) lands a player controls would help to prevent it from generating obscene amounts of mana, especially early in the game; and four, having manalink directly generate mana would make it a mana ability, defeating the purpose of making it a triggered ability instead of a static ability. The purpose of making manalink a triggered ability instead of a static ability like lifelink is twofold: for one thing, it was easier to word it as a triggered ability, but the other reason is because I wanted it to be possible to counter with effects like Stifle (as another way to control its potential brokenness). 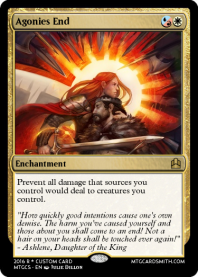 Like lifelink, while the reminder text shown here refers to creatures, I see no reason why it couldn't be applied to anything that's capable of dealing damage. As for what colors would get it... well, the way it combines life-leeching and land manipulation means that it would be either black/green or black/blue, and one could make a pretty good argument for using white instead of black, but it wouldn't make sense as a white/black or blue/green ability. [ http://gatherer.wizards.com/Pages/Card/Details.aspx?name=savage+ventmaw ] isn't a mana ability), triggered abilities aren't mana abilities unless they are triggered by a mana ability. [605.1b] A triggered ability is a mana ability if it meets all of the following criteria: it doesn’t have a target, it triggers from the resolution of an activated mana ability (see rule 106.11a), and it could put mana into a player’s mana pool when it resolves. Is "Earthbond" a better keyword name? Need you dudes again, @kkarn, @Corwinnn, @Tomigon, @Memnarchitect, @cadstar369, @Platypusburger, @Animist, @AustinSmith, @Gelectrode, @Grimshac, & @Cryptonight. The word "itself" is a thing: http://gatherer.wizards.com/Pages/Search/Default.aspx?action=advanced&text=+[itself] (copy paste the link if it doesn't work by istelf). Since this is true, for clarity on certain rules text, couldn't we use it? e.g. - Whenever [Creature Name] becomes blocked by a creature with toughness equal to or less than [Creature Name]'s power, [Creature Name] gets +X/+X until end of turn, where X is equal to the number of +1/+1 counters on itself. Using just "it" instead of "itself" can make it hard to determine (and believe me there are harder situations) which creature it is counting the counters on. The creature that blocked or [Creature Name] itself? I'm thinking of a card which reads "Prevent all damage that sources you control would deal to creatures you control." It would be for "damage board wipes" [ http://gatherer.wizards.com/Pages/Card/Details.aspx?multiverseid=373604 ] and things like http://gatherer.wizards.com/Pages/Card/Details.aspx?multiverseid=113559 etc. The reason those cards say 'itself' instead of 'it' is because the permanent is specifying that it is performing an action in which it is both the subject and the object of the damage-dealing effect. In other words, it is the creature that deals damage, itself is what it deals damage to. In your hypothetical ability, in contrast, you are placing a counter on a permanent, meaning it's not putting the counter onto itself. You perform the action, and the creature is the object. As far as I can tell, dealing damage is the only sort of action a creature could do that would require the word 'itself'. Everything else (e.g. tapping, attacking, blocking, etc.) doesn't affect both a subject and object, so it's not necessary. Is TheMechanix still happening, @Corwinnn? @CrucibleOfHate - Yes, but we've been working on CS17 for a while and it's distracted us a little... but we will be getting back to it soon! @Faiths_Guide Landbond works fine. (Landlink, maybe?) And your wording is quite a bit better, too. @Luigifan Glad you like the updated wording I suggested. If I were you I'd try and stay away from using the actual card type in the keyword. If you do, it opens the door for other type keywords too readily, and (IMO) it isn't the best unless that's the intention. Terrabond? Earthlink? Restore? Something with "Harvest" or "Seed"? The "goes to the graveyard" wording means the effect won't trigger if you overkill an indestructible creature, for example. The "before the next time a player would receive priority" wording is to make sure the creature dies on the very next state-based effect check (so no other effects have a chance to damage it). Distressed- A distressed creature's abilities and keywords have no effect (in other words, making a creature distressed makes it completely vanilla). Tsunami X: Whenever this creature attacks, tap up to X target permanents defending player controls. they dont untap during their controller's next untap step. Had a bunch on my old account, but it got deleted. I came up with a new mechanic while trying to think of a way to make my latest card idea make sense. 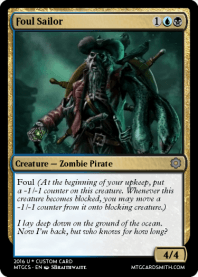 By the way, if a creature gets enough fragility or weakness counters put on it to reduce its toughness to 0, it goes to its owner's graveyard as a state-based action before its controller gets a chance to pay mana to remove the counters. Also, since removing fragility, weariness, and weakness counters is an activated ability, it can be countered by effects like Stifle (but a single counter effect would only be good for negating the removal of a single counter, which the foe would only pay 1 mana for, so it probably wouldn't be worth it). Also, since weakness counters aren't -1/-1 counters, they aren't subject to the rule that -1/-1 counters and +1/+1 counters on the same permanent remove each other. (The same is true of fragility counters relative to -0/-1 and +0/+1 counters, and of weariness counters relative to -1/-0 and +1/+0 counters.) They coexist on the permanent, effectively nullifying each other without removing each other. Of course, the reason for this is that removing weakness, fragility, and weariness counters is as simple as making a small mana payment.